We are nearing the end of the summer and the heat in Brooklyn has been sweltering. Something like stepping into a walk-in oven, if such a thing existed. The last thing I want to do is turn my oven on to make a meal. Cold soups are a cooling, refreshing meal. 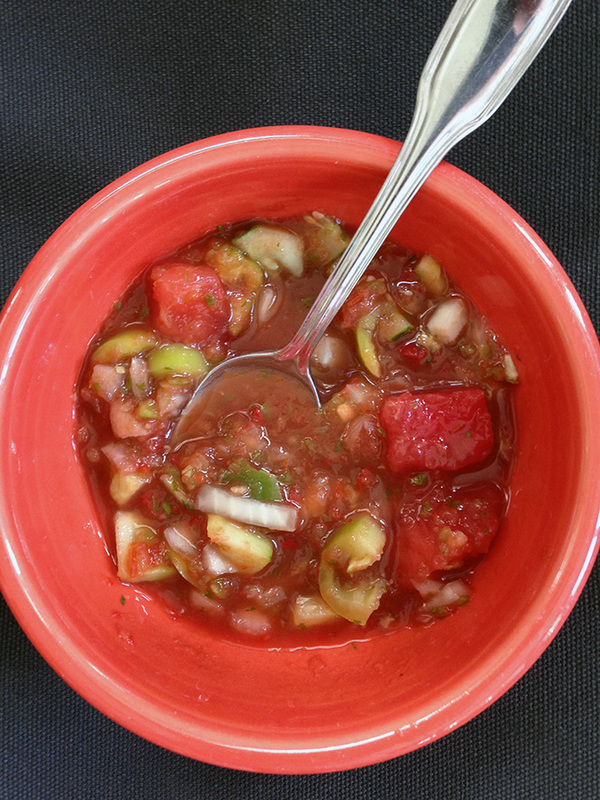 Simple to make and with vegetables at their ripest what better time to make some gazpacho. I try to use up what I have from my CSA (community supported agriculture) and try not to buy anything new so sometimes I do skip an ingredient. Below is the gazpacho recipe I found last year on Food52. one 46 ounces bottle of low-salt vegetable juice, such as low-salt V8 or low-salt 365 "Vital Veggie"
The ingredients I did not use are the 46 ounces of vegetable juice, I replaced red onion with white onion and 2 small scallions and also added some small heirloom tomatoes from my garden. Also replaced the yellow pepper with a green pepper. Ingredients I added because I've been seeing Gazpacho recipes this past season with watermelon so I added a few cubes. I really liked it, my father who tried it, didn't think it had enough oomph as he said. He likes spice. So I added 3 pickled jalapeño slices that he had in the refrigerator and half a large sweet pepper. We will see if that makes a difference. Check back soon, with Gazpacho #2.